In today's economy, it is more frequent to find that model companies are more politically correct than the normal range of businesses. This is especially true when it comes to models of racing cars. Frequently cars are sponsored by tobacco or alcohol companies. As models are allegedly aimed at a young audience, the decals that come with many kits will be devoid of these markings, despite the fact that the real car was racing with them clearly in view. As a result, this has spawned a need for accurate decals to go along with new kits and when it comes to racing car kits produced by Tamiya, Hasegawa and Fujimi, Tabu comes to the rescue. 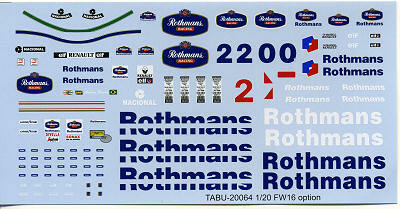 This particular sheet is for the Fujimi Williams FW 16 as raced in 1994. The sheet includes all the 'missing' markings for the Fujimi kit as well as several other small items. The decals themselves are superbly done; crisp and clear with no registration errors. There is no placement guide, which could be a problem for some, but one simply has to look on the internet and images of the car will not be difficult to find. Thanks to www.hlj.com for the review set.